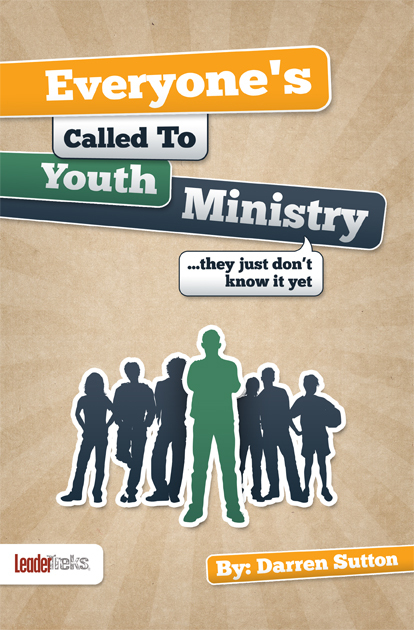 Recently I finished reading Darren Sutton’s book Everyone’s Called to Youth Ministry-They Just Don’t Know It Yet. It’s the title that caught my eye when I decided to purchase a copy of this book. If someone is willing to write a book on the claim that everyone is called to youth ministry than I’m willing to give the book a shot. This book is all about volunteers and how student pastors must find them, know how they work, place them, train them, and release them to do ministry. Sutton says, “I know in the heart of most youth workers there is a fervent desire to see as many people involved in youth ministry as possible, and that’s just what this book is about” (page 7). Sutton believes that everyone in the church who have come to faith in Christ has something to offer the youth ministry and the next generation of believers. They may not be able to be a teacher or small group leader, but they can pick up students or help plan outreach events. “Each person in your congregation who has had the wonderfully transforming and defining moment with Christ has a glorious deed or a mighty wonder to share with the next generation” (page 5). If you take the title of this book at face value and don’t read what Sutton has to say you will be tempted to disagree with the idea that everyone is called to youth ministry. It’s not that everyone in your church must serve as a small group leader or Sunday school teacher, but that everyone in your church has some way they can serve students in your ministry. The goal of the student pastor then is to find out how each person fits into the youth ministry. I really liked how Sutton laid out this book. The book basically walks you through how to go from finding a volunteer all the way to releasing them to do ministry with your students. It has much to say about how to recruit volunteers, how to train them, and how to effectively get them doing ministry with your students. There is also a ton of helpful resources packed in the appendix section. I enjoyed reading this book and picked up a few ideas I am going to implement into our youth ministry. It’s easy to read and very practical. I’d encourage any student pastor who is striving to become better with managing volunteers to grab a copy of this book and give it a read. Also, make sure and follow Darren on Twitter @darrensutton and check out his blog.